Dubai: To celebrate the 45th UAE National Day, 2,223 students from GEMS Education schools in the UAE, gathered to form the ‘World’s Largest Transforming Human Image’ and set another Guinness World Records title in the process. 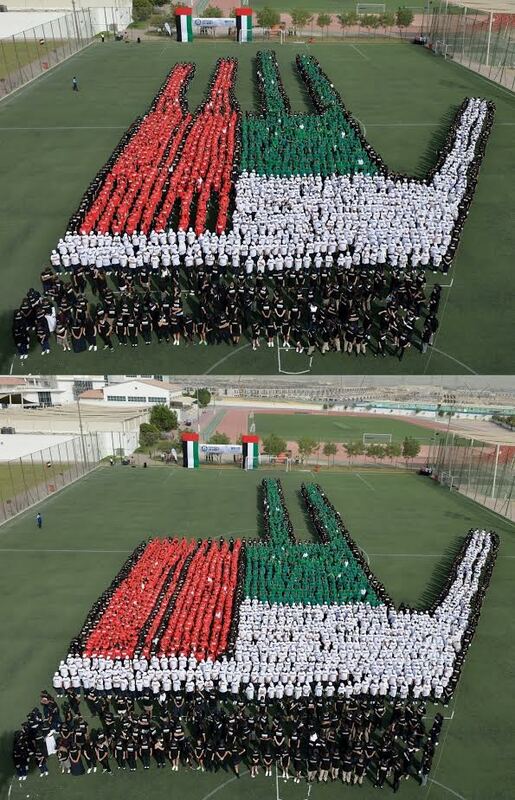 With a majority of students coming from Our Own English High School, Sharjah Girls, all the students were dressed in the colours of the UAE flag, and they created an image of an open hand and then transformed into the iconic three-fingered salute introduced by His Highness Sheikh Mohammed bin Rashid Al Maktoum, UAE Vice President and Prime Minister and Ruler of Dubai. The three-finger salute created by the Dubai Ruler in February 2013 during the Government Summit in Dubai, symbolising ‘Win’, ‘Victory’ and ‘Love’, is an innovative trademark to inspire youth in work, ethics, success and love of the nation. 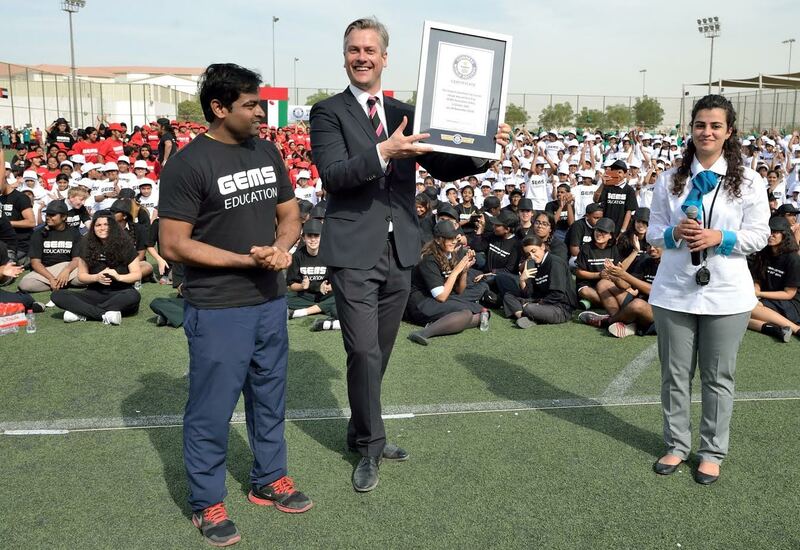 The record was validated by Guinness World Records officials at the GEMS Modern Academy sports grounds. Largest Transforming Human Image – 28 Nov 16. Dino Varkey, Managing Director and Board Member, GEMS Education, said: “The UAE has transformed itself over the last 45 years into a dynamic modern nation that is admired by the rest of the world for its ability to evolve and change with the times. By creating the ‘World’s Largest Transforming Human Image’ we wanted to pay tribute to the rulers of the UAE for their visionary leadership which served as a catalyst for the growth GEMS Education in this land. This is the third world record attempted by students of GEMS Education and the second record that they have created as a category. Previously in 2015, GEMS students paid tribute to the UAE for National Day by creating the record for the world’s largest human sentence. In 2014, students of 119 nationalities from GEMS Education sang the UAE national anthem at one time, creating a new world record.